St Annes Diamonds have got their sparkle back thanks in no small part to hat-trick hero Max Robinson. dd St Annes Diamonds have got their sparkle back thanks in no small part to hat-trick hero Max Robinson. After a difficult start to the season in the Under-13 division of the Blackpool and District Youth League, Neil Jones’ side made it back-to-back wins with a 3-1 success over Warton Typhoons at Blackpool Road North last Saturday, when striker Robinson scored all three. Max showed fine positioning and clinical finishing to put the hosts two up at half-time, and although the Typhoons pulled one back the unstoppable Robinson added a third to regain control for his side. 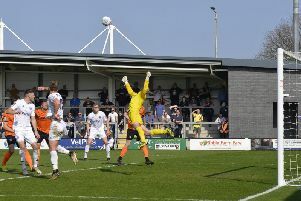 Ethan Armett bundled the ball home for Warton, but the goal didn’t give them the impetus they had hoped for and the visitors created few further chances. Right-back Alan Knox, centre-half Dylan Frewer and goalkeeper George Kitchener were all excellent for the Diamonds, making their man of the match decision a tough one, but ultimately there was no denying three-goal Robinson. St Annes manager Jones hopes his side’s fortunes are turning after these consecutive wins. He said: “We dominated last Saturday and were good value for the win. We restricted them to very few chances. After a very encouraging performance against Kirkham the previous weekend, Typhoons boss Archie Gemmill was disappointed by this step backwards for his side. He said: They deserved it. They were first to most balls and we were sloppy. It was as though we were running through treacle. “We were hoping to build up some momentum but we keep losing away from home. Harry Gemmill stayed strong at the back to be named the Typhoons’ man of the match.